Did you find any mouthwatering recipes this week? If you liked this post please Tweet, Stumble, “Like” or share with your friends. Thanks for including my Monkey Bread! You are welcome Tiffany. I love your recipes. Love your blog! Lots of delicious recipes, thanks for the extras today. I have seen lots of your recipes to try first. Keep up the good work!!!! Thank you for stopping by and commenting. Hope to see you back soon. Yum!! All of my favorite foods! Thanks for linking up! The Somoa bars look delicious! I’m adding these to my “to-bake” list! 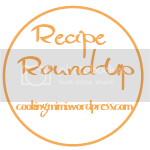 Lots of good recipes… Thanks for posting! Found your site from Simply Staci – so glad I did! These recipes sound fantastic and we need a change of pace over here. Great site!